From left, top row: Axel Medina, Kobe Robbins, Gustavo Bravo, Elijah Sword, Ceasar Rivas, Jordyn Wilson and Skyler Muonio-Kawecki; from left, middle row: Stefan Fellner, Shea Stewart, Ella Chan and Keelan Giannini; and from left, bottom row, Koson Verkler and Ethan King all competed for NTS this year. 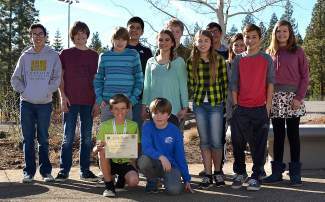 TAHOE CITY, Calif. — In Tahoe City on Jan. 26, North Tahoe School sixth-grader Koson Verkler won the school competition of the National Geographic Bee — giving him a chance at a $50,000 college scholarship. The school bee, in which students answered questions on geography, served as the first round in the 27th annual National Geographic Bee. Additionally, the following North Tahoe students competed as finalists. Sixth-grade representatives included: Ella Chan, Keelan Giannini, Ethan King, Jordyn Wilson and Koson Verkler. Seventh grade was represented by Gustavo Bravo, Skyler Muonio-Kawecki, Shea Stewart and Elijah Sword. For eighth grade, Stefan Fellner, Axel Medina, Ceasar Rivas and Kobe Robbins participated. All contestants made it through the first three rounds of competition. Entering the fourth round, the field narrowed to Giannini, King, Verkler and Wilson. By the eighth round, King and Verkler stood alone as the remaining competitors. For the Championship Round, each student was asked three questions, and their answers had to be documented on a whiteboard. After the series of final questions, King answered one correctly, while Verkler secured the win with two correct responses. Thousands of schools around the United States and in the five U.S. territories are participating in the 2015 National Geographic Bee. School champions, including Verkler, have taken a written test; up to 100 of the top scorers on that test in each state will then be eligible to compete in their state bee, scheduled for March 27. The National Geographic Society will provide an all-expense paid trip to Washington, D.C., for state winners to participate in the national championship rounds May 11-13, 2015. The first-place national champion will receive a $50,000 college scholarship; a lifetime membership in the society, including a subscription to National Geographic magazine; and a trip to the Galapagos Islands, courtesy of Lindblad Expeditions and National Geographic. Visit http://www.nationalgeographic.com/geobee to learn more. Katie Jamison is a seventh- and eighth-grade social studies teacher at North Tahoe School.